More automated gates are being installed at a couple locations in Iowa to block traffic from getting on interstates during severe winter storms. Iowa D.O.T. winter operations administrator Annette Dunn says the gates cost about $15,000 each. In the past, the D.O.T. has parked snowplows on on-ramps to stop traffic during a blizzard. 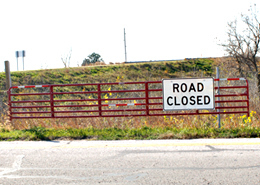 The new gates, which can be controlled remotely, will be used to close I-35 northbound near Ames and I-29 northbound at Missouri Valley in western Iowa. Manual gate formerly used to close the interstates in severe weather. “The actual gates are in place at this time,” Dunn said. “The things that are not in place are the actual motors that go on them. Those hopefully will be completed in the next week or two as we get ready for the winter season.” The first set of automated gates was installed in January near Mason City at the southbound I-35/U.S. Highway 18 interchange. Photos courtesy of the Iowa D.O.T.